Mayakoba, together with officials of the PGA TOUR, announced today that Mexico's Only PGA TOUR Event will move to November as the event joins the new fall portion of the PGA TOUR FedExCup schedule. The next edition of the tournament is slated for the week of Nov. 11 - 17, 2013. For more information, visit www.ohlclassic.com. As a result of the scheduling change, the event now boasts its own unencumbered date on the PGA TOUR calendar affording any PGA TOUR player, regardless of world ranking, the opportunity to compete in Mexico's Only PGA TOUR Event should he meet qualifying criteria and wish to play. Previously the tournament had been held in February opposite the World Golf Championships-Accenture Match Play Championship, prohibiting the top 64 players in the world from enjoying the chance to compete at Mayakoba. Additionally, officials announced an updated name for the event which will now be known as the OHL Classic at Mayakoba to reflect the commitment of tournament title sponsor and resort developer, OHL Developments. "We are honored to continue as host of Mexico's Only PGA TOUR Event and extremely pleased to now have our own week on the TOUR schedule," said Andres Pan de Soraluce, CEO of OHL Developments, owner and developer of the Mayakoba Resort. "In many ways a new era has been born for this tournament and we are excited about our new date and look forward to a bright future. We are confident the 2013 tournament will be a signature event for Mexico and for golf worldwide. As always, we are eager to share the beautiful Mayakoba resort as well as the Riviera Maya and Cancún regions with the best golfers in the world and an international television audience." As part of the announcement, officials also unveiled an increase in the total purse to $6 million USD guaranteeing the winner will earn a check of more than $1 million USD. The OHL Classic at Mayakoba will continue to offer the largest amount of prize money of any golf tournament in Latin America, a distinction it has held since its inception in 2007. With this new date, the tournament will continue to be a part of the season-long FedExCup competition and will now distribute a full allocation of FedExCup points. In addition to a winner's check of $1.08 million USD, the champion will also earn 500 FedExCup points. Previously, the event awarded 250 points to the first-place finisher. "The OHL Classic at Mayakoba has been a favorite tournament of many PGA TOUR players the past six years," said Andy Pazder, Chief of Operations for the PGA TOUR. "In this new unencumbered date near the start of the season, all TOUR players will now have an opportunity to experience the world-class Mayakoba Resort and its challenging El Camaleón championship course. We are grateful for OHL's partnership and look forward to the continued growth in stature of the OHL Classic at Mayakoba." The OHL Classic at Mayakoba made golf history when the tournament was first conducted in 2007, becoming Mexico's Only PGA TOUR Event. A six-year contract extension was announced in November 2011 which will keep the tournament part of the PGA TOUR landscape through the 2018 season, representing a total commitment of 12 years by the PGA TOUR to Mexico. In addition to the commitment of the PGA TOUR to Mexico through 2018, today's announcement also assures the continued worldwide television and media presence of the OHL Classic at Mayakoba. As the only PGA TOUR event scheduled for the week of Nov. 11-17, 2013, the golf world will be focused on Mexico. The event boasts more than eight hours of television coverage and is broadcast to more than 200 countries around the globe, providing Mexico and its Riviera Maya and Cancún regions with unprecedented exposure to an affluent global audience. OHL, a multi-billion dollar construction and development company based in Madrid, Spain, serves as the tournament's primary sponsor after developing the Mayakoba resort as a tourism complex. Included in the award-winning resort are three luxury hotels and the tournament venue, the Greg Norman-designed El Camaleón Golf Club. Further development at Mayakoba will see the construction of two additional luxury hotels and the creation of a second phase of the property which will ultimately feature a second championship-caliber golf course and additional hotels and real estate properties. "We are proud that all the hard work the past six years has been recognized by the PGA TOUR, the players and the community as we start a new chapter for this tournament with our own date," said Joe Mazzeo, Tournament Director of the OHL Classic at Mayakoba. "We look forward to a new era of PGA TOUR golf here at Mayakoba and making the 2013 tournament a truly special event." Through its first six years, the OHL Classic at Mayakoba has donated nearly $1.5 million USD to local, national and international charities. In an effort to grow the game of golf in the Riviera Maya and Cancún regions, the tournament created Golf PARa Todos, or Golf FORE Everyone. The one-day golf clinics are held throughout the year. The community event aims to create a fun-filled, diverse and educational program that teaches about the game of golf and its ideals. In February 2012, PGA TOUR rookie John Huh outlasted Australian Robert Allenby in a thrilling and record-setting eight-hole, sudden-death playoff. With more than $2.6 million in 2012 earnings, defending champion Huh is a strong candidate for 2012 PGA TOUR Rookie of the Year. 2007 saw PGA TOUR veteran and fan favorite Fred Funk win the inaugural OHL Classic at Mayakoba when he outlasted Argentina's Jose Coceres in a two-hole sudden-death playoff. Other champions of the event include Brian Gay (2008), Mark Wilson (2009), Cameron Beckman (2010) and Johnson Wagner (2011). Through six years, Mayakoba has welcomed some of the biggest names and most accomplished players in professional golf. Among the event's past participants are: Stuart Appleby, Aaron Baddeley, K.J. Choi, John Daly, Jason Day, David Duval, Bill Haas, J.B. Holmes, Charles Howell III, Fredrik Jacobson, Lee Janzen, Jerry Kelly, Matt Kuchar, Tom Lehman, Graeme McDowell, Greg Norman, Jose Maria Olazabal, Rory Sabbatini, Brandt Snedeker, David Toms, Scott Verplank, Bubba Watson, Boo Weekley and more. Since its inception in 2007, 12 Mexicans have participated at Mayakoba. An 11th place finish by Esteban Toledo in 2008 marks the best performance by a Mexican player in the event's history. 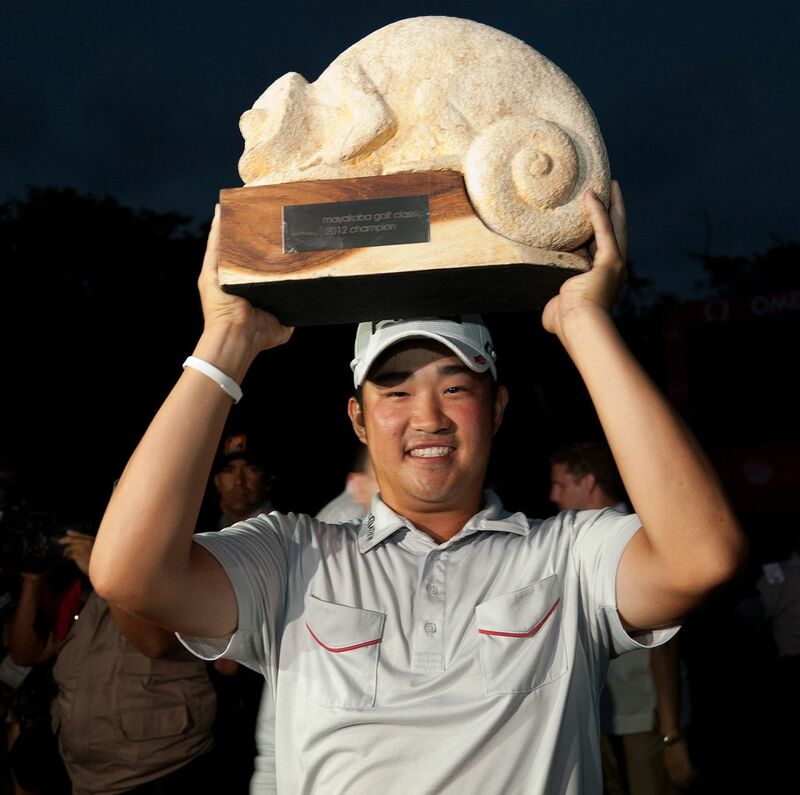 For further information about the OHL Classic at Mayakoba, please visit www.OHLClassic.com.